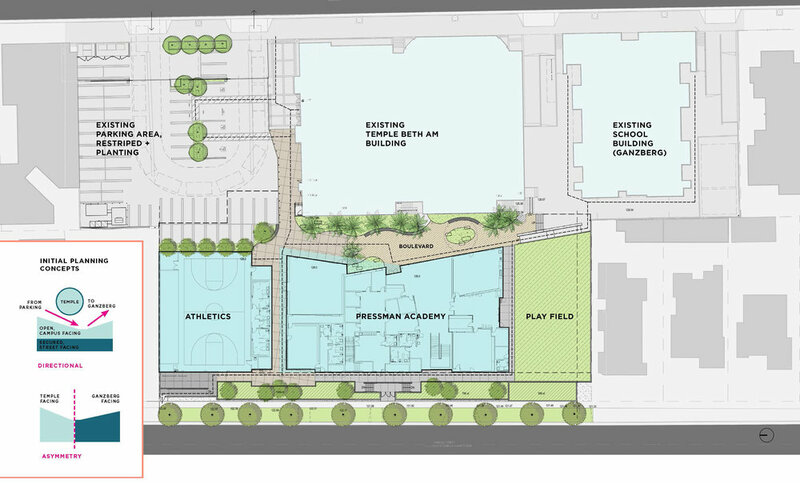 The design process for Pressman Academy, a Private Jewish Middle School, began with a series of visioning meetings that involved every one of its teachers, the administration, temple leaders, and the greater community. These meetings informed the conceptual intent for the project: a thoroughly contemporary learning environment filled with maker spaces and incorporating space for the community, as well as the school program. The resulting design is not the typical double-loaded corridor layout used in most middle schools, but a more flexible and open plan which immediately allows visitors to understand an alternative learning model is in play. A high level of connectivity between indoors and outdoors, particularly in the plaza between the school and the neighbouring temple, establishes a visual and spatial sense of community.